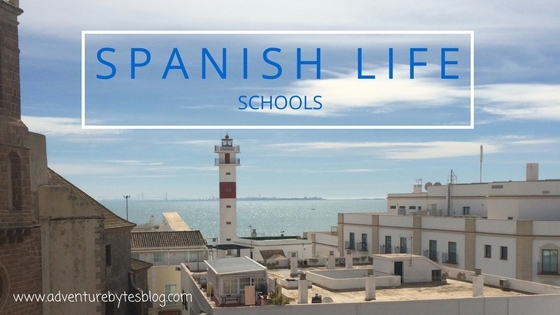 The Peanut had her first day of her 2 años class last week -- so I figured this would be a good time to write a little about the Spanish school system, or what I know of it so far at least. So, Serafina attends a guardería, a kindergarten in the true sense of the German word -- or a nursery school or preschool, essentially. Her school has uniforms (adorable), a set curriculum with units and lessons, they give progress reports and everything. All of Serafina's teachers have a teaching degree (most specialize in early childhood education). The teacher to student ration is much much higher than you would ever see in an American preschool -- there are 20 kids in Serafina's class and ONE teacher. Yes, I said ONE. They usually have high school helpers each day (as a part of their own high school diploma) but I swear, those kids are so well behaved and it just boggles my mind that one teacher can control 20 two year olds, but I have seen it. And all of this is fairly common for all traditional guarderías in Spain, at least from what I have figured out. Public school in Spain starts around age 3 -- which is free (or a small fee is paid for supplies or if you choose to go to a private school). Spain does not have kindergarten because what Americans call kindergarten is an entirely American concept, so the first three year of public school (called 3 años, 4 años and 5 años), are a little like American kindergarten. The students all stay with the same teacher for these three years (called looping). Serafina's school also loops, so she has the same teacher as last year. The big kicker for public school is that your kid has to be fully potty trained which is one big reason why many Spanish kids are potty trained much earlier than American kids. Because Serafina attends a guardería, she does not have to be potty trained, but she is -- because they work with the kids starting well before they enter public school. Public school hours are 9am to 2pm without lunch because remember -- the Spanish don't eat lunch until after 2pm, so all the kids go home and have lunch with their families. Serafina also goes to school the same hours, but hers are more flexible -- I can drop her off a little late or pick her up early and it's not a big deal. And she does eat lunch at school -- a three course meal that is better and more well rounded than anything I could ever prepare at home -- and she eats it! The cutoff date for starting public school is December 31. For 3 años class -- you must turn three by December 31 of that year to start in September. Classes are all based on birth year. Kids who started 3 años this year were all born in 2014. All of Serafina's class was born in 2015. And because of this, she will not start at public school until next fall -- she misses the cut off by four weeks. She will be 3 1/2 when she finally starts public school and will be one of the older ones in her class -- as is the case for her current class. There is a really long crazy complicated process to sign up for public school which starts in March. I still don't quite understand it even though I had many good friends go through the process this past March -- that'll be us this March, so I better get ready! But I can discuss about enrolling Serafina into her guardería. Last year when she attended, the school was private, so I just had to sign up at the school -- this year they switched to public to get more government funding so I had to go through some hoops to keep her enrolled. I first had to go to city hall and ask for the paperwork for a certificate of residency (to prove I live here), then I had to fill out the paperwork, then return the paperwork with all of the needed documents (passport, visa, housing rental agreement, etc), pay a small fee and wait.... And pray I did all of it correctly because yes, it was ALL in Spanish. And no one at city hall spoke English, not one word. They told me it would take 10 days by mail for the paperwork to arrive, but in true Spanish fashion, it took over a month! So I took it and the school registration paperwork to Serafina's school and officially registered her. And I think that is it -- I will update this post as I learn more, especially as we go through registration/enrollment for public school next year!